This species is accepted, and its native range is Macaronesia, Medit. to Ethiopia and W. Nepal. It is used as a medicine and a food additive. Alt. 1350 - 2850 m.
Robust, glabrous, somewhat glaucous perennial herb up to 2 m.
Stems rigid when mature and with many fine distinct ribs. 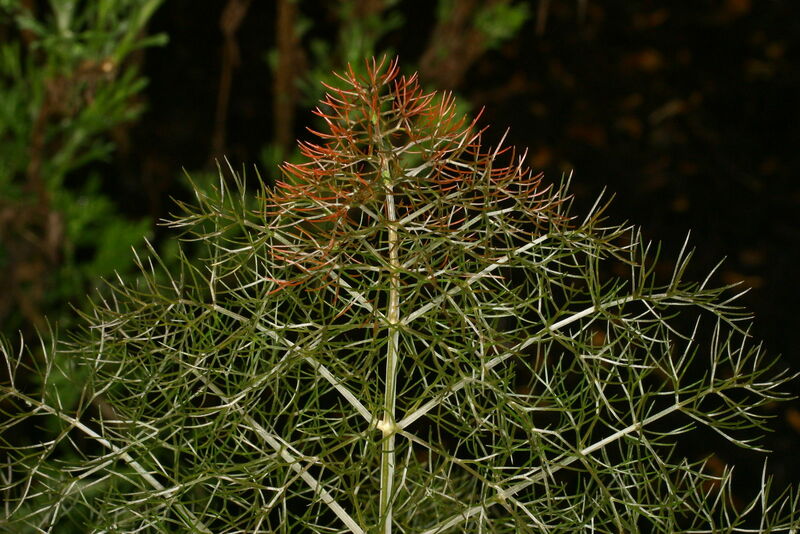 Leaves with well-developed sheathing bases, up to 5 cm. 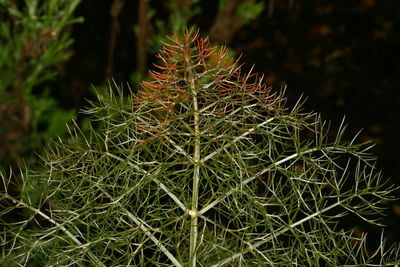 long but frequently much shorter, 3–4-pinnate with finely-divided ultimate segments which are narrowly linear to capillary, becoming reduced upwards towards the inflorescence and finally occurring only as sheathing bases with 0–few linear lobes. Umbels terminal and lateral, rays (4)9–30, 1–11 cm. long, relatively robust and somewhat glaucous. Partial umbels with up to 12 flowers on pedicels 5–10 mm. long; bracts and bracteoles 0 (rarely few). Calyx teeth obsolete; petals bright yellow. Fruit 4–8 mm. long, narrowly ovoid at maturity, very distinctly glaucous-grey especially when immature; stylopodium rather low. Mericarps with ribs that are obvious at maturity, but inconspicuous in young fruit. Erect, glabrous, biennial or perennial herb 0.6–2(–2.4) m. tall, glaucous particularly above with a strong but pleasant aromatic odour resembling aniseed; root usually slender. Stem sparingly to considerably branched, wiry, terete, finely striate. Lower leaves 3–4-pinnate, with mostly 4–7 pairs of pinnae dissected into capillary segments very variable in length, ± 0.4–12 cm. × 0.5–0.75 mm., each terminating in a sharp generally brownish mucro; largest leaves up to 0.5 m. long, broadly deltoid; petiole ± 2–5 cm. ; sheaths narrowly oblong, finely striate, 3.5–12(–20) cm., narrowly membranous-margined, auriculate at the top with blunt to acute, membranous auricles; upper leaves rapidly reducing, sessile on the sheaths, the uppermost often ± reduced to sheaths alone or with a short “brush” of leaflets. Umbels numerous, on mostly 2.5–14 cm. peduncles; rays (3–)10–25(–30), glabrous, usually unequal, 2–6(–10) cm; partial umbels ± 6–23-flowered, on glabrous, 0.5–7(–10) mm. pedicels. Petals ± 1 mm., yellow. Fruit oblong-ellipsoid, slightly laterally compressed, ± 4–6 × 1.75–2.5 mm., the ribs pale and prominent, calyx obsolete; stylopodia at first short, in ripe fruit shortly cylindrical-subconical, margins crenulate; styles short, strongly deflexed on and shorter than the stylopodia. An introduction, naturalised in disturbed places; 1650 m.
Cultivada en Colombia; Alt. 1350 - 2850 m.; Andes. 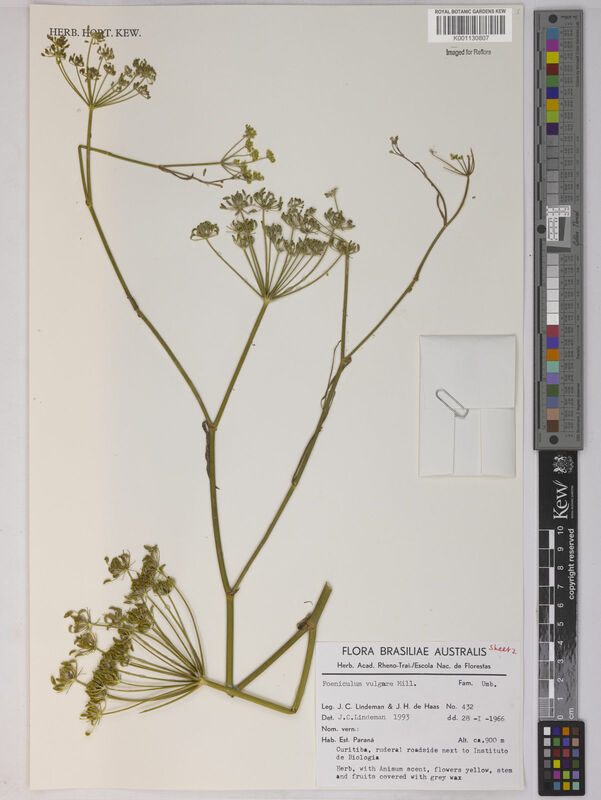 Stems and leaves - Used as a condiment (Cadena-González 2010, Florez-Cárdenas et al. 2010). Leaves - Used in liquid medicines (Lagos-López 2007). Used for increasing breast milk production (Florez-Cárdenas et al. 2010). Stems and leaves - Used in liquid medicines combined with agua de panela (sugar cane drink) (Cadena-González 2010). Hohla, M., Diewald, W. & Király, G. (2015). 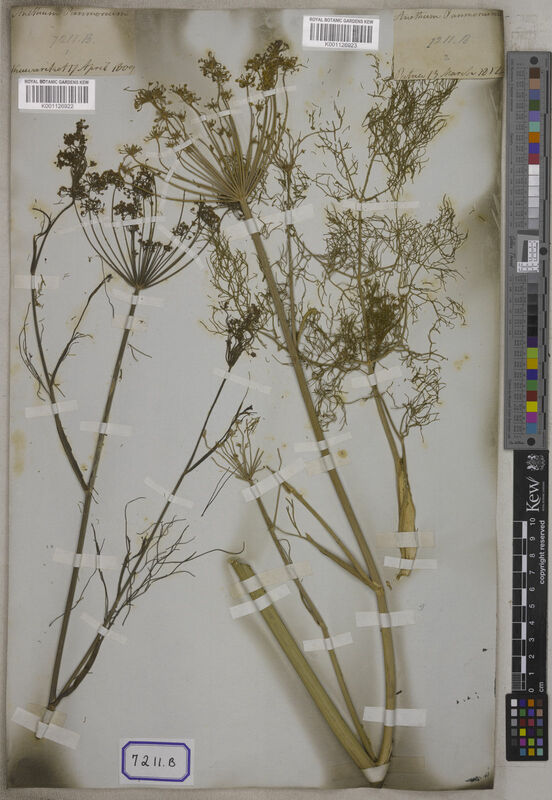 Limonium gmelinii - eine Steppenpflanze an österreichischen Autobahnen sowie weitere Neuigkeiten zur Flora Österreichs Stapfia 103: 127-150. Van Wyk, B.-E., Tilney, P.M. & Magee, A.R. (2013). 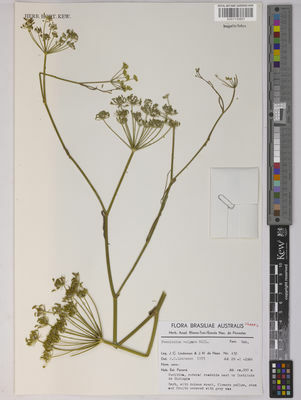 African Apiaceae: a synopsis of the Apiaceae/Umbelliferae of Sub-Saharan Africa and Madagascar: 1- 317. Briza Academic Books, Pretoria. Wu, Z. & Raven, P.H. (eds.) in Flora of China Editorial Committee (2005). Flora of China 14: 1-581. Science Press (Beijing) & Missouri Botanical Garden Press (St. Louis). Townsend, C.C. (1989). Flora of Tropical East Africa, Umbelliferae: 1-127. Cannon in Flora Zambesiaca 4: 607 (1978). A.D.Q. Agnew, Upland Kenya Wild Flowers p. 357 (1974). Cannon in Consp. Fl. Angol. 4: 353 (1970). 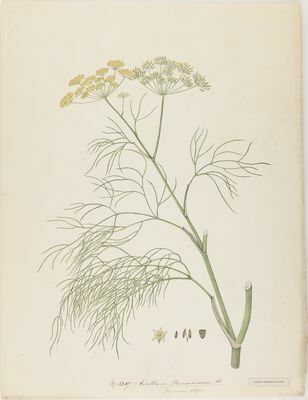 Cufod., Enumeratio Plantarum Aethiopiae Spermatophyta (Supplement in Bull. Jard. Bot. Brux.) p. 647 (1959). F. W. Andr., The Flowering Plants of the Anglo-Egyptian Sudan 2: 362 (1952). Mill., Gard. Dict., ed. 8, No. 1 (1768).